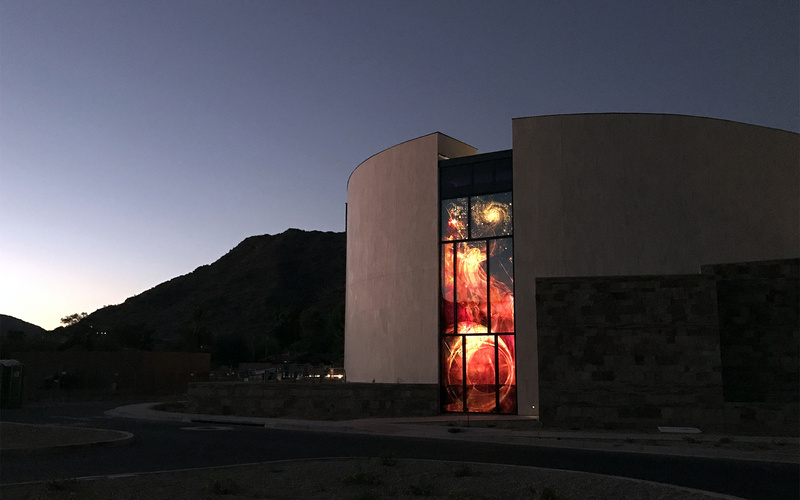 Nine commissioned windows created for the new Our Lady of the Angels Conventual Church at La Casa—The Franciscan Renewal Center in Scottsdale, Arizona. 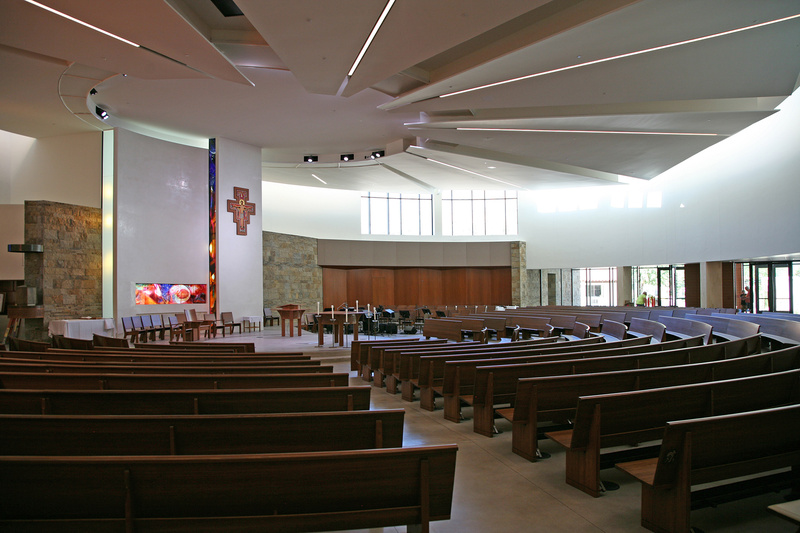 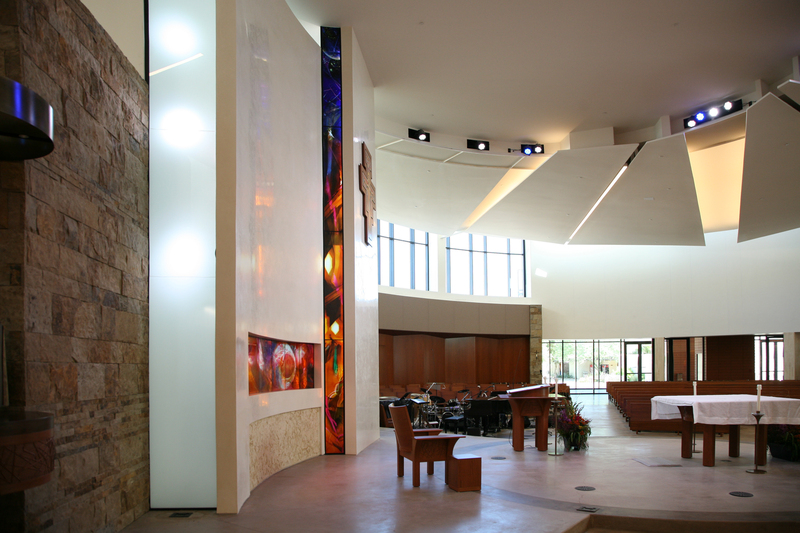 Designed as a place for worship within the broader mission and ministry of the Franciscan Renewal Center, the Conventual Church of Our Lady of the Angels builds upon and expands the hospitality and welcome that has long marked the community of La Casa. 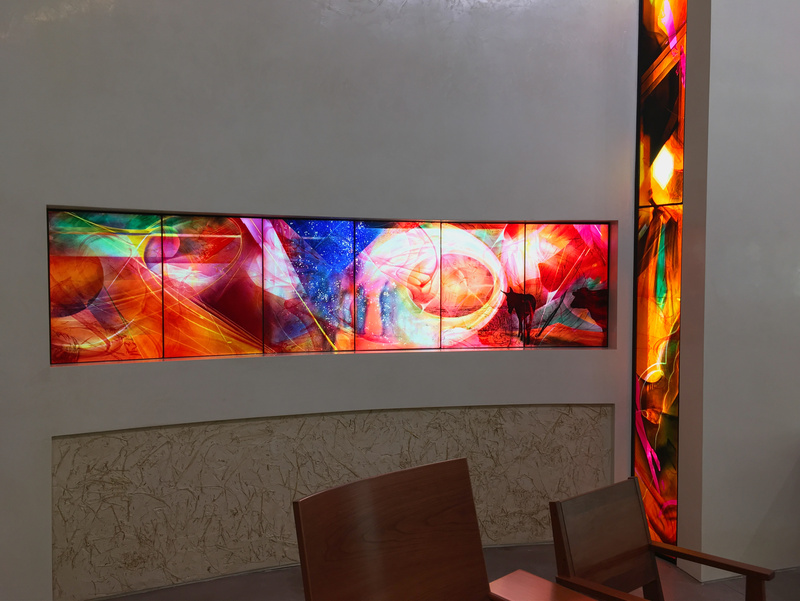 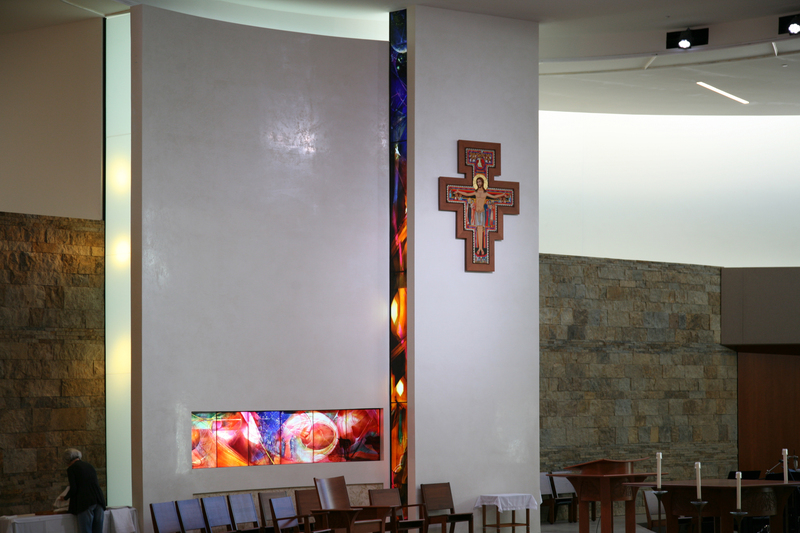 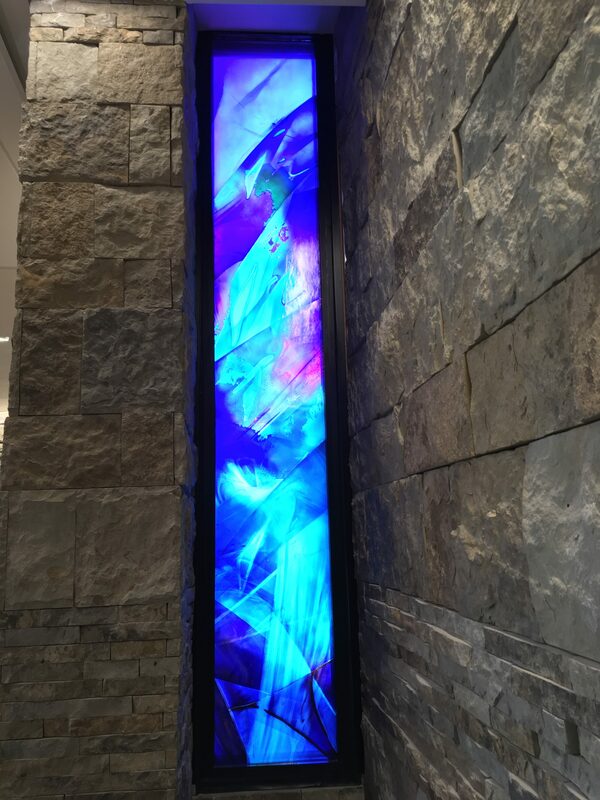 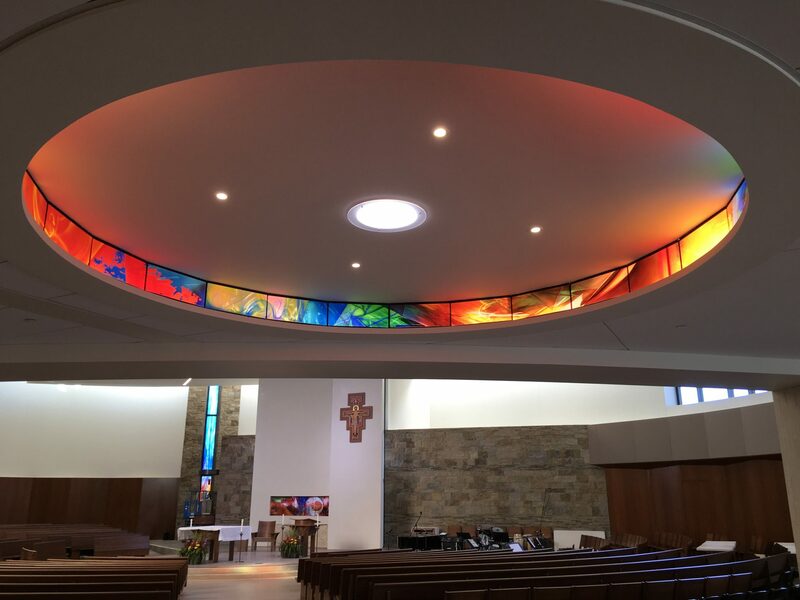 Nine works of liturgical art glass were commissioned by the Franciscan Renewal Center for this new church construction and developed thematically in conversation with the Liturgical Art Committee to share the community’s invitation into the process and grace of renewal. 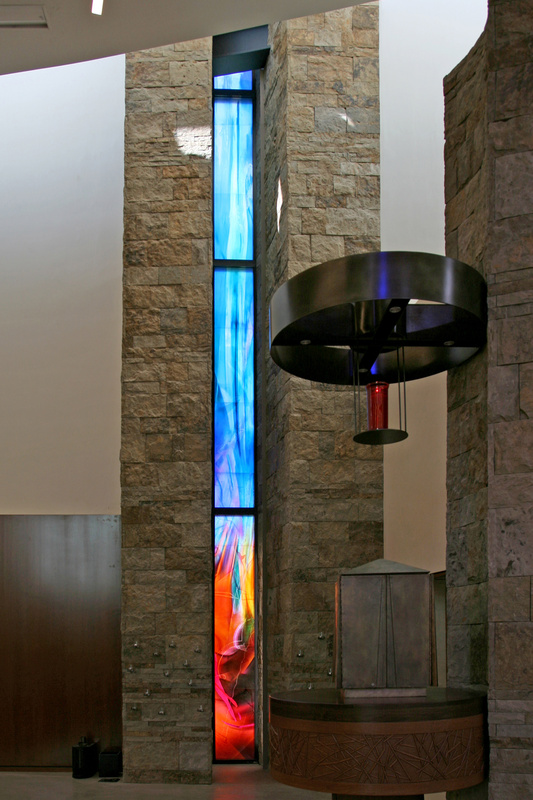 The major vertical element, visible when one enters the site, is the south art glass window. 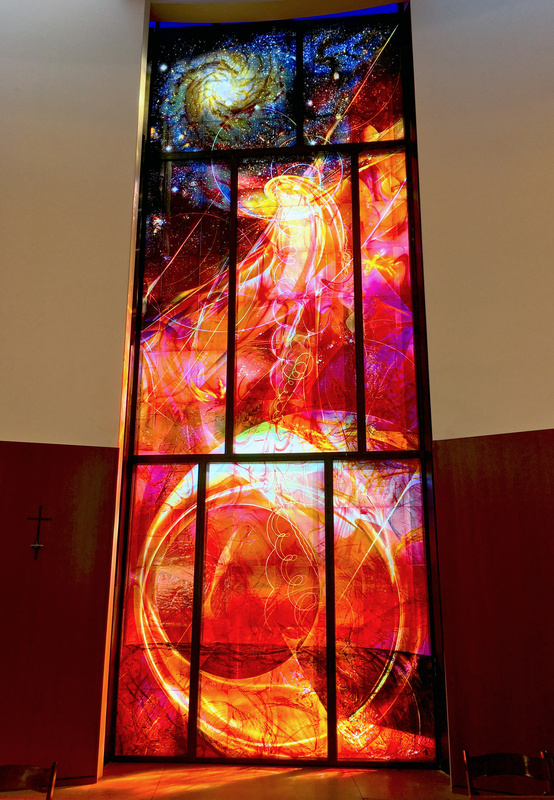 This central element images the earthly Mother of God accompanied by angels, ascending to her place in heaven as the woman clothed in the sun. 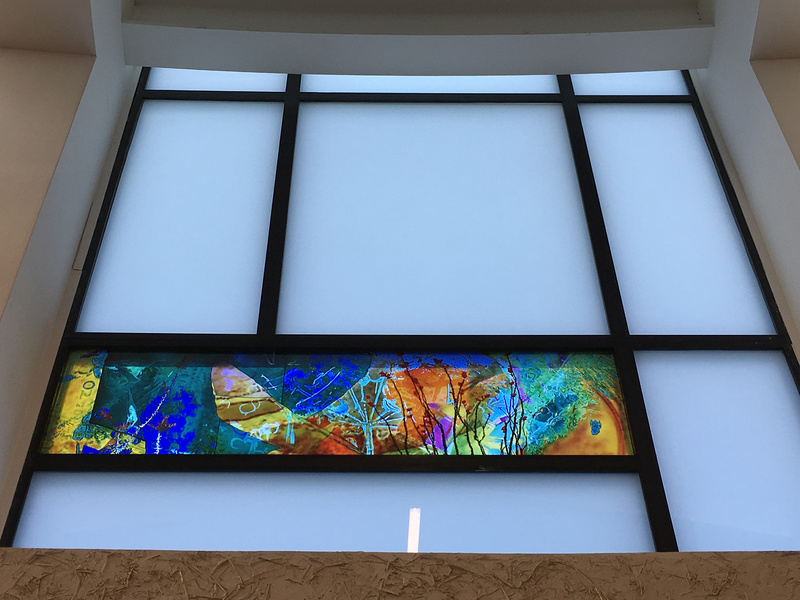 As a beacon to those who enter and an image of the church’s patroness, this window clearly identifies the church without overshadowing the liturgical environment within the building. 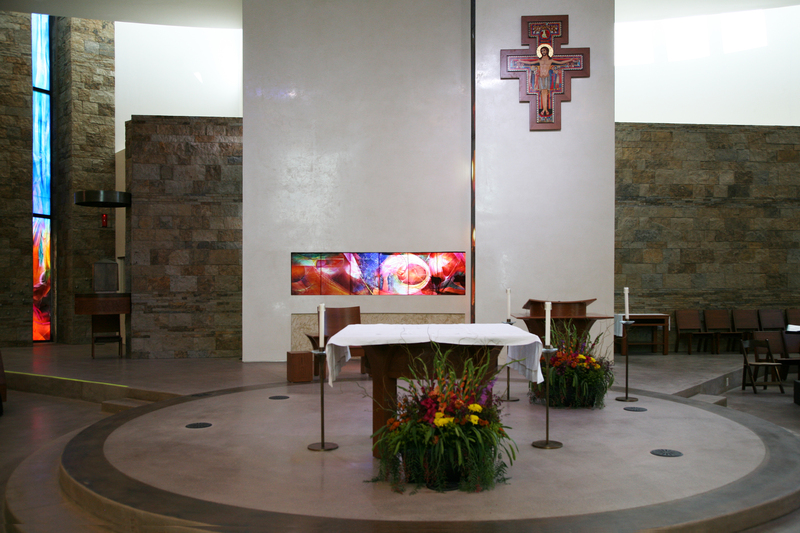 The design for the window was deeply inspired by Bonaventure, wherein the circle is a potent image of the movement from and return back. 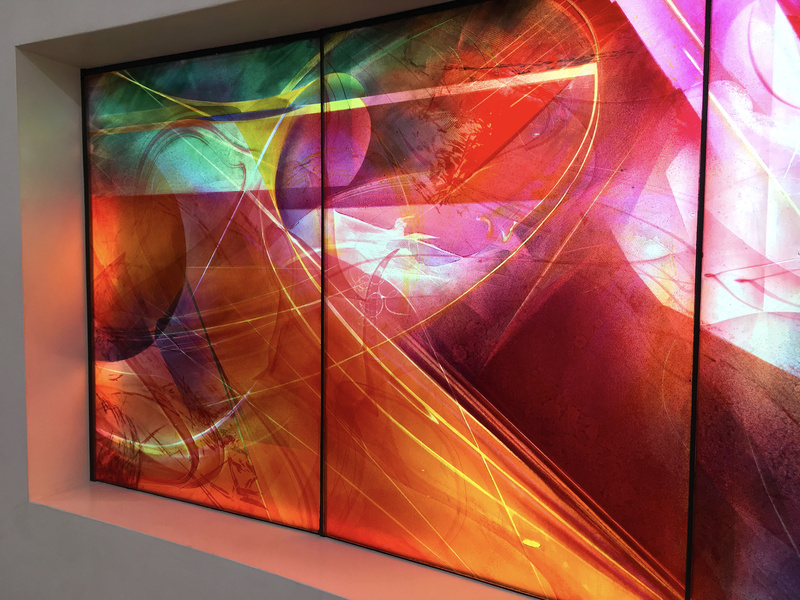 All of creation is called back to the creator in this vision of the cosmos returning to the divine mystery that made it. 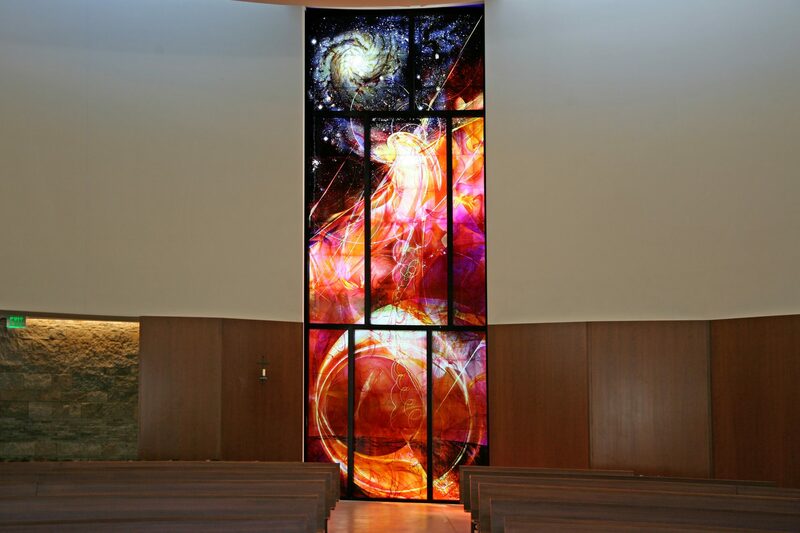 The cosmic dimension of creation and redemption are brought together in this window and include Hubble-inspired images of a multitude of galaxies. 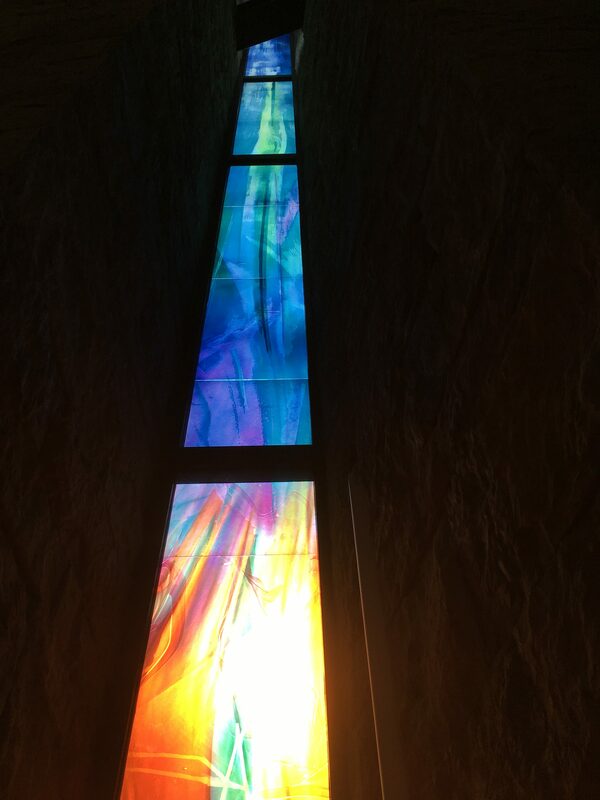 The praises of Saint Francis from the Canticle of Creation which begin to form in the Marian window are echoed in the other commissioned windows throughout the church. 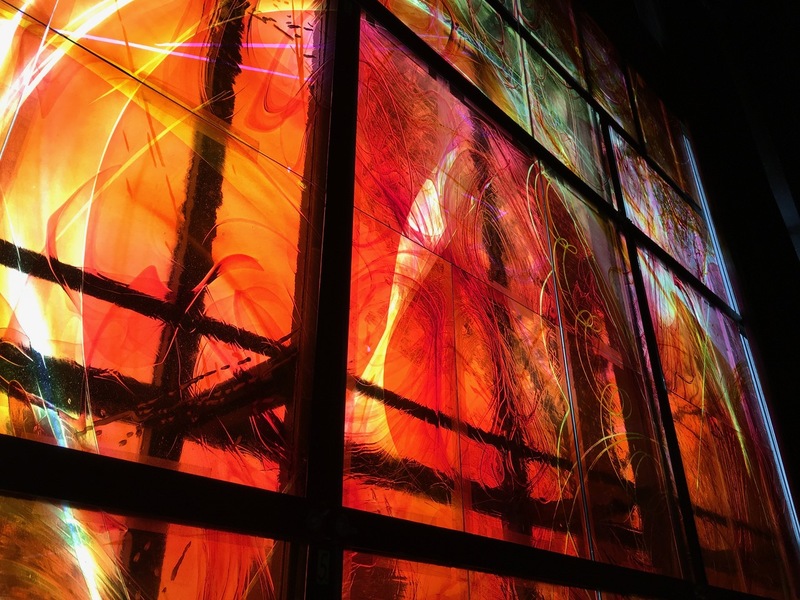 Images of Sister Death, Fire, Brother Wind, Water, Sun, Stars, and Mother Earth surround the community in the smaller windows throughout the worship space. 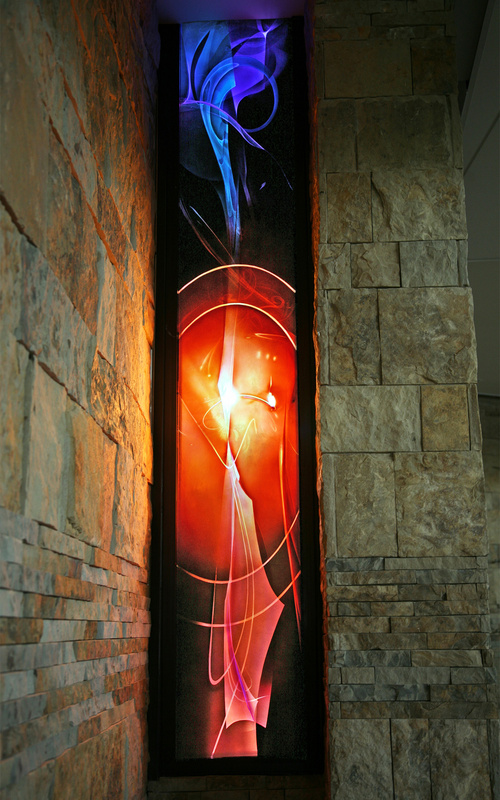 The Greccio reredos glass envisions the humility of Christ and the cosmic significance of his incarnation as a dimensional-warping of the universe seen from the hills outside of Bethlehem. 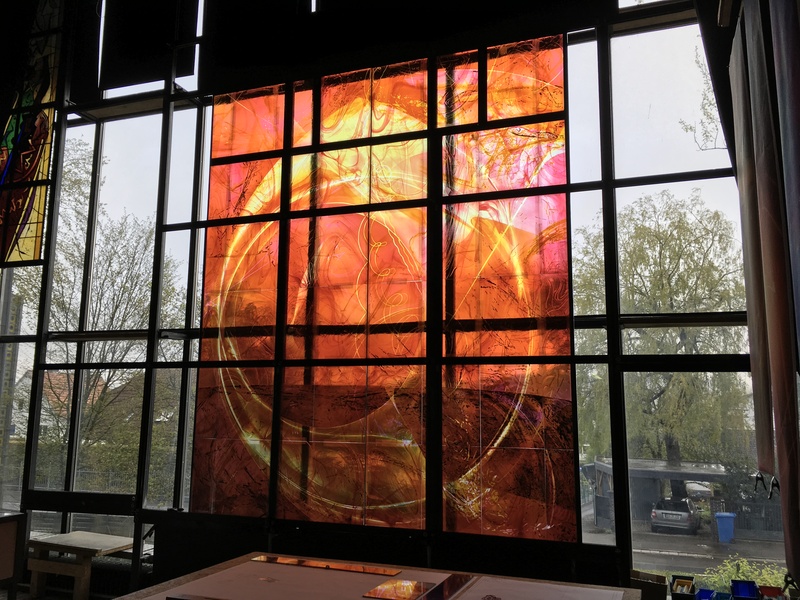 Each glass panel was cut and pieced together from mouth-blown antique glass using a number of traditional and contemporary glass techniques, including silver stain, acid-etching, sandblasting, and enameling. 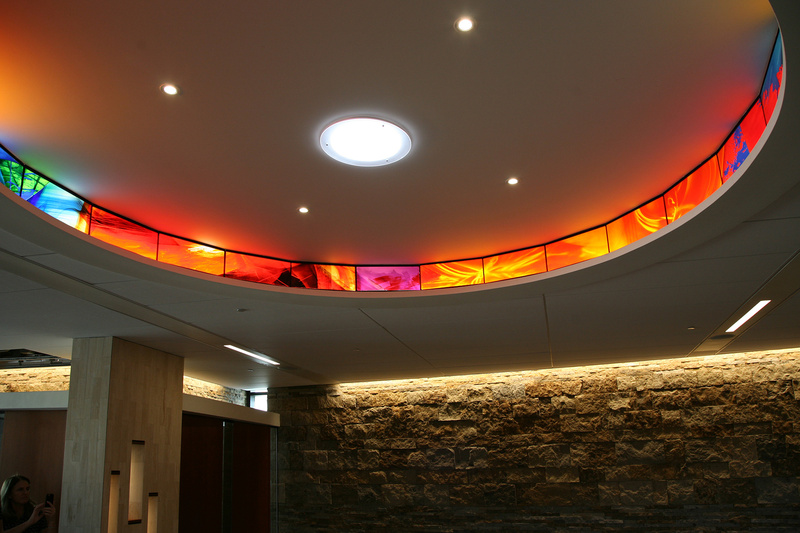 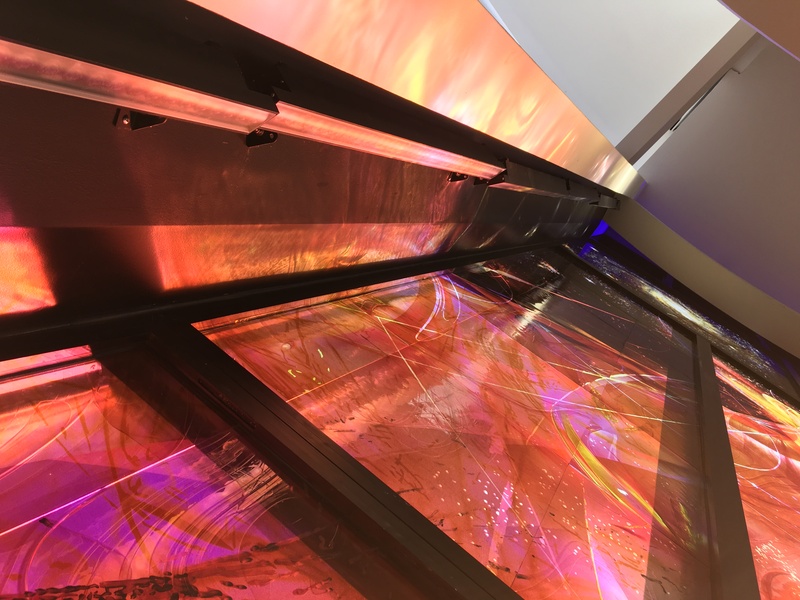 The mouth-blown glass is laminated to a carrier safety glass panel without the use of traditional lead came. 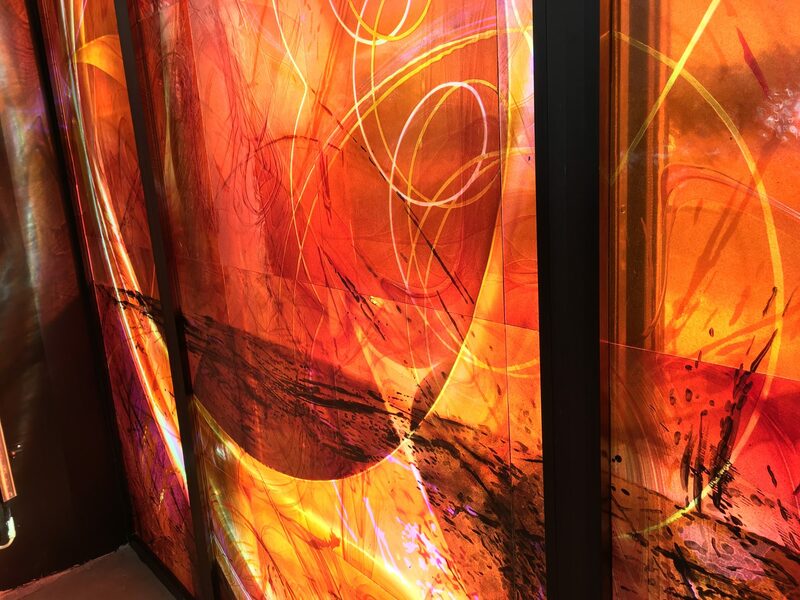 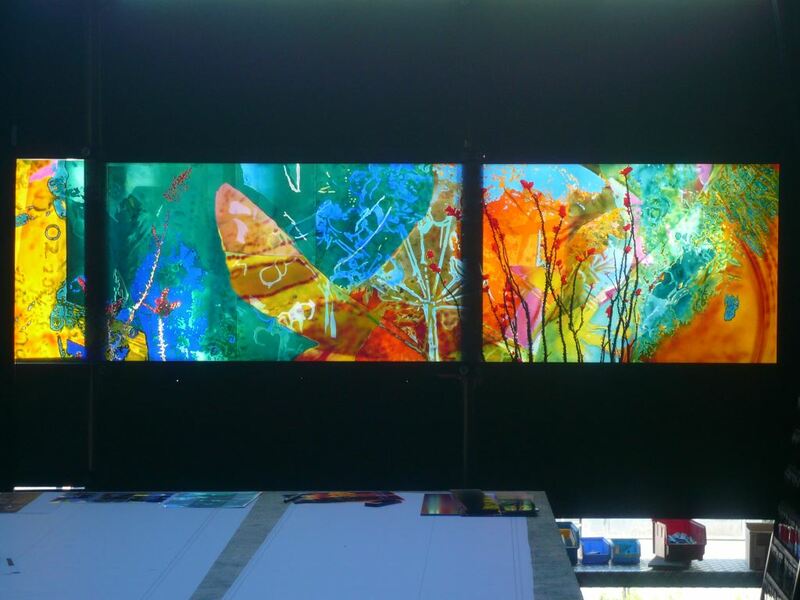 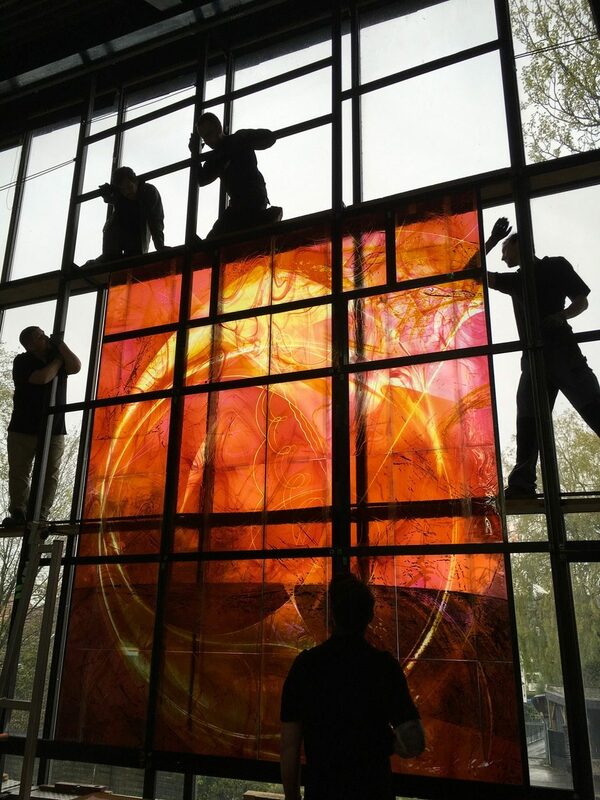 Three art glass panels exceed 30 feet in height while another is over 30 feet in length. 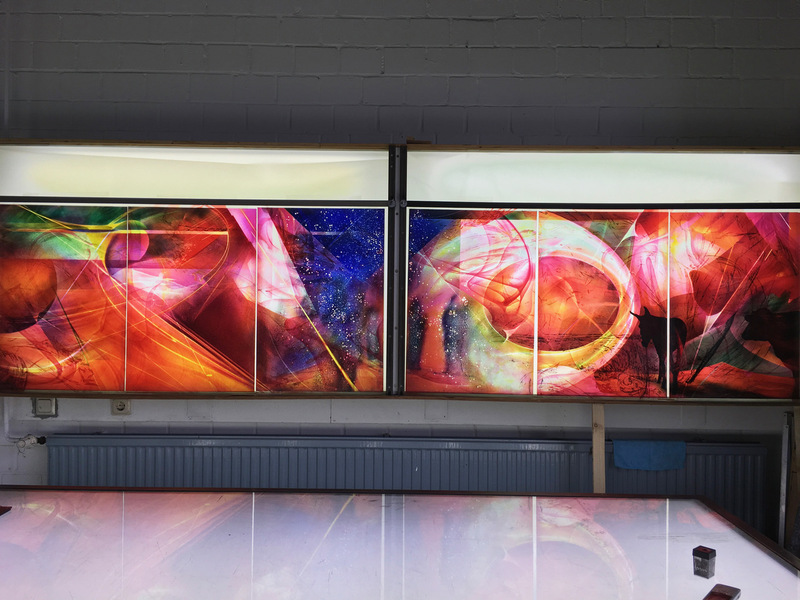 Painting by Olaf Hanweg at Derix Glasstudios. 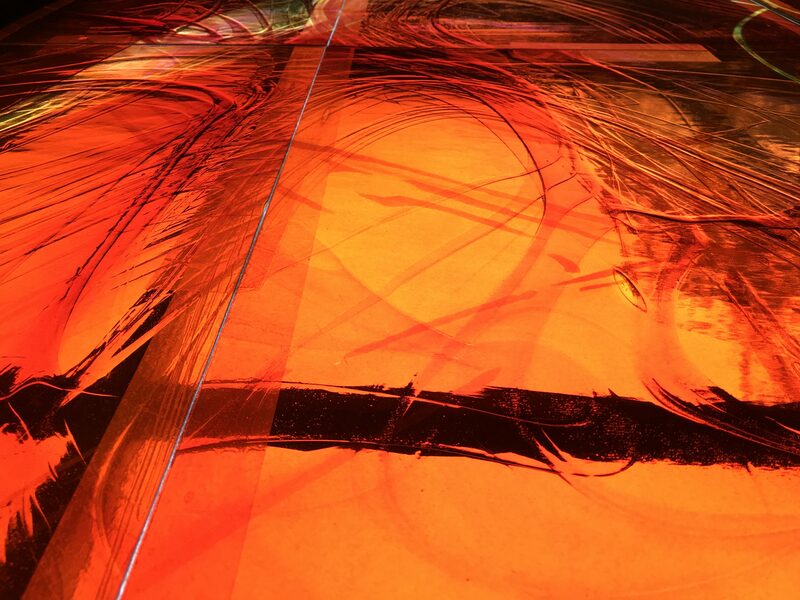 Glass etching by Roman Olichowski. 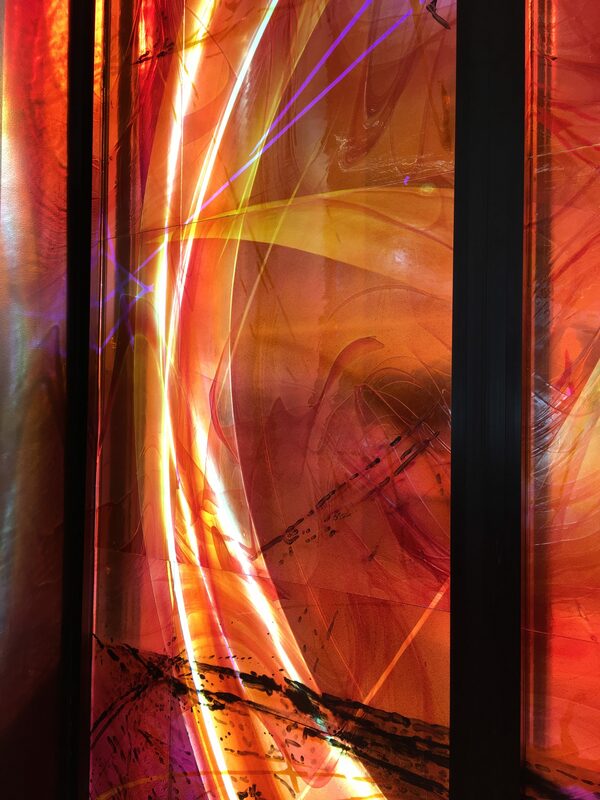 Glass cutting by Karl Heinz-Traut. 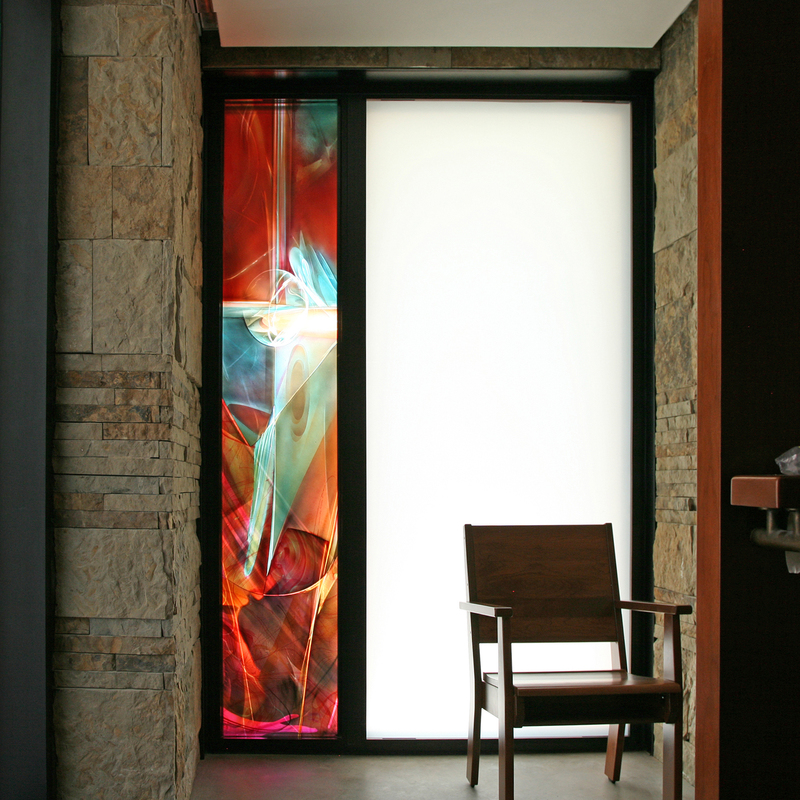 Glass grinding and fitting by Johanna Feltes. 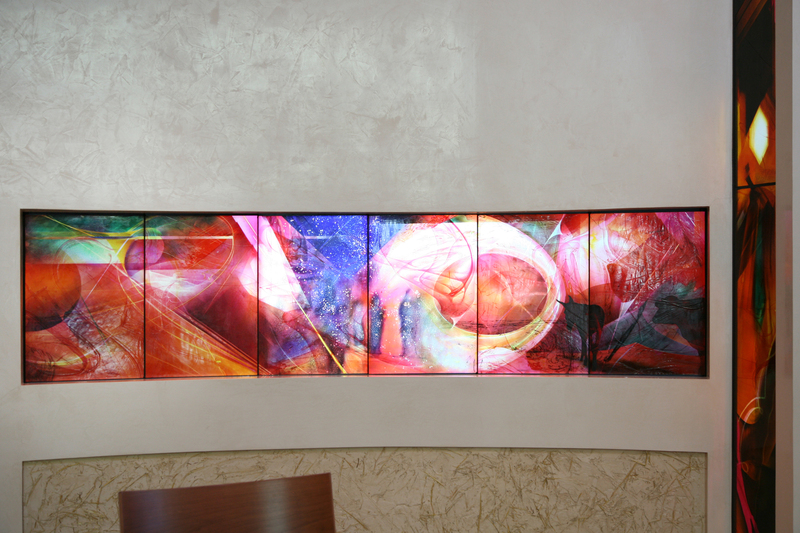 Nine commissioned stained glass windows for new church construction at the Franciscan Renewal Center.